International Series of Monographs in Electrical Engineering, Volume 2: Modern Practice in Servo Design focuses on servomechanics and feedback control systems. The selection first takes a look at basic servomechanism theory, including block diagrams, servo components and compensation, power amplification, absolute stability, transfer functions, and frequency response design methods. The book then discusses the design of a large servomechanism and development of the servo design, as well as digital servo techniques, effects of disturbances, performance specification, mechanical resonance, and completed control loop and its stability. The text describes the design of large antennas for radio telescope and satellite trackers. Topics include servo system performance, tracking accuracy requirements, closed loop performance, and dynamic performance. 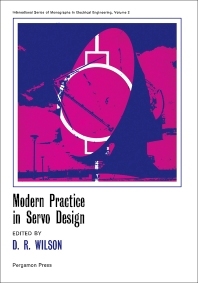 The book also takes a look at the application of analog computers to the design of a servomechanism and the use of hybrid computers in servo design. The selection is a valuable source of information for readers interested in servomechanics and feedback control systems. I am 77. This ancient tome uses the math I was taught in college. Guess what, the laws of physics haven't changed even if the method of teaching has! Very practical design examples of real systems from start to finish. Get out your slide rule!